Maltose (/ˈmɔːltoʊs/ or /ˈmɔːltoʊz/), also known as maltobiose or malt sugar, is a disaccharide formed from two units of glucose joined with an α(1→4) bond. In the isomer isomaltose, the two glucose molecules are joined with an α(1→6) bond. Maltose is the two-unit member of the amylose homologous series, the key structural motif of starch. 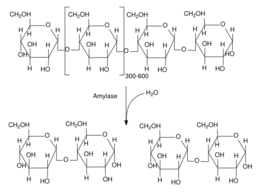 When beta-amylase breaks down starch, it removes two glucose units at a time, producing maltose. An example of this reaction is found in germinating seeds, which is why it was named after malt. Unlike sucrose, it is a reducing sugar. Maltose was 'discovered' by Augustin-Pierre Dubrunfaut, although this discovery was not widely accepted until it was confirmed in 1872 by Irish chemist and brewer Cornelius O'Sullivan. Its name comes from malt, combined with the suffix '-ose' which is used in names of sugars. Maltose making and use in China goes as far back as the Shang dynasty. In Japan, the use of maltose has been recorded since the period of Emperor Jimmu. 2OH substituent of the same ring, resulting in either α-maltose or β-maltose. An isomer of maltose is isomaltose. This is similar to maltose but instead of a bond in the α(1→4) position, it is in the α(1→6) position, the same bond that is found at the branch points of glycogen and amylopectin. Like glucose, maltose is a reducing sugar, because the ring of one of the two glucose units can open to present a free aldehyde group; the other one cannot because of the nature of the glycosidic bond. Maltose can be broken down to glucose by the maltase enzyme, which catalyses the hydrolysis of the glycosidic bond. Maltose in aqueous solution exhibits mutarotation, because the α and β isomers that are formed by the different conformations of the anomeric carbon have different specific rotations, and in aqueous solutions, these two forms are in equilibrium. It has a sweet taste, but is only about 30-60% as sweet as sugar, depending on the concentration. A 10% solution of maltose is 35% as sweet as sucrose. Maltose is a component of malt, a substance which is obtained in the process of allowing grain to soften in water and germinate. It is also present in highly variable quantities in partially hydrolysed starch products like maltodextrin, corn syrup and acid-thinned starch. In humans, maltose is broken down by various maltase enzymes, providing two glucose molecules which can be further processed: either broken down to provide energy, or stored as glycogen. The lack of the sucrase-isomaltase enzyme in humans causes sucrose intolerance, but because there are four different maltase enzymes, complete maltose intolerance is extremely rare. ^ Weast, Robert C., ed. (1981). CRC Handbook of Chemistry and Physics (62nd ed.). Boca Raton, FL: CRC Press. p. C-367. ISBN 0-8493-0462-8. .
^ a b Stoker, H. Stephen (2 January 2015). Organic and Biological Chemistry. Cengage Learning. ISBN 9781305686458. ^ a b Fruton, Joseph S (1999). Proteins, Enzymes, Genes: The Interplay of Chemistry and Biology. Chelsea, Michigan: Yale University Press. p. 144. ISBN 0300153597. Retrieved 21 October 2017. ^ O'Sullivan, Cornelius (1872). "XXI. ?On the transformation-products of starch". Journal of the Chemical Society. 25: 579–588. doi:10.1039/JS8722500579. Retrieved 11 December 2014. ^ Belitz, H.-D.; Grosch, Werner; Schieberle, Peter (15 January 2009). Food Chemistry. Springer Science & Business Media. p. 863. ISBN 9783540699330. ^ Spillane, W. J. (17 July 2006). Optimising Sweet Taste in Foods. Woodhead Publishing. p. 271. ISBN 9781845691646. ^ Furia, Thomas E. (2 January 1973). CRC Handbook of Food Additives, Second Edition. CRC Press. ISBN 9780849305429. ^ Whelan, W. J.; Cameron, Margaret P. (16 September 2009). Control of Glycogen Metabolism. John Wiley & Sons. p. 60. ISBN 9780470716885. Maltose, Elmhurst College Virtual Chembook.